Home / Blog / Immerse Yourself In the World of AR. Augmented Reality enhances a person’s view of the world around him or her. This technology gives the viewer a new way to learn about his or her favorite restaurant, clothing store, vacation spot, etc. Underlying these applications is your smartphone’s GPS and Compass features. There are many smartphone applications providing augmented reality features, such as: Yelp’s Monocle, Wikitude, Google Ingress, Aurasma and Layar. Yelp’s Monocle: In 2013, Yelp users found a hidden gem in the Yelp application. If the user shook his or her phone, a camera popped up on the screen and, depending on the direction in which the phone was pointing, in addition to the user’s location, the camera listed each restaurant surrounding him or her as well as reviews and ratings for each. Now, two years later, the Monocle feature is embedded into the application and is found by clicking the “more” option in the bottom right-hand corner of the screen. Wikitude: Similar to Yelp’s Monocle, Wikitude provides the user with every restaurant in the surrounding area; however, Wikitude also includes a list of destination “hot-spots”, a currency converter and information about establishments and vacation spots provided on Wikipedia. 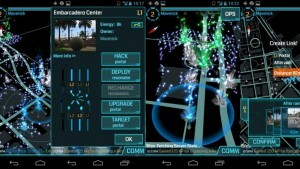 Google Ingress: Ingress differs from most augmented reality applications. Ingress is an augmented reality video game allowing a user to battle other users based off of their location. The user’s environment is the playing field and the object of the game is to keep other players away from a secret energy source. The image above details how the screen looks as you are playing. Aurasma: Aurasma allows users to view concealed content, aka “Auras,” in a variety of advertisements, locations, and objects. Also, the user can create original Auras using his or her own images and videos to learn more about a product. 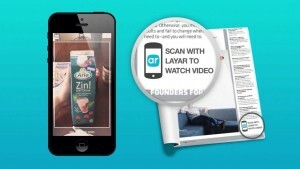 Layar: The Layar application, shown above, is comparable to Aurasma. The user can “connect digital content with the real world” using this application, as explained in Layar’s program description. 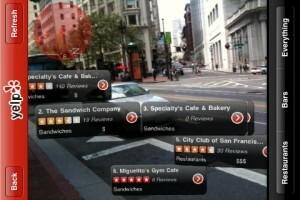 Layar also allows the user to point his or her phone at a piece of media, food, location, etc. and view content normally unavailable without a Google search. Augmented Reality has been in the works for decades, but until recently it has not been so easy for any person with a smartphone to use such advanced technology. Augmented Reality is a new way to access embedded information, and the best part is, the applications are entertaining to use. These five programs are only a few of the many, which permit users to take advantage of the material augmented reality offers. The applications listed can help you start benefiting from a world only augmented reality presents.